Find answers below to frequently asked questions about standing desks and treadmill desks. A standing desk is a desk that offers its user the ability to stand upright while writing, drawing and/or typing. Some standing desks are designed solely for standing, while some offer sit-to-stand functionality. Standing desks are about three times as popular as treadmill desks, mostly because the investment in capital, space and obtaining permission (from the boss at work or spouse at home) is much smaller. That said, standing desks are a common stepping stone on the way to a full-function treadmill desk, so when shopping for one keep in mind the space clearance you may someday wish you had for a treadmill base. Innovative manufacturers have even developed the “Desktop Riser” which allows users to turn their current sitting desks into standing desks simply by setting the desktop riser on top of their desktop. Examples of this include the VariDesk Standing Desk (formerly called “VersaDesk”) and the Standee Bamboo Standing Desk. What are the different types of standing desks? The ThermoDesk Elite is width and height adjustable. Electric height adjustable desks provide the most convenience and flexibility for your treadmill workstation. If more than one person will regularly be using your work treadmill we highly recommend you consider the various powered height adjustable desks on the market. Many of these units even offer stored settings capabilities that allow for quick and easy transitions from one treadmill desk worker to another. The powered desk with programmable position settings is usually the most expensive option. Examples of powered adjustable-height desks include the ModTable Mod-E, GeekDesk, VersaTable Edison Electric and LifeSpan DT-7. ThermoDesk Ellure desks from iMovR currently head up the crank desk category. Manual height adjustable desks, while requiring slightly more effort than the power adjustable height desks, offer the same flexibility for the multi-user environment as their electrically inclined brethren but without the motor works. 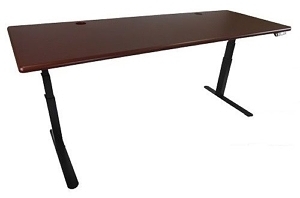 Typically, an adjustable height table crank desk can raise and lower just as fast (or even faster) but cannot offer the stored user settings for quick return to a previous height. Crank desks are usually priced in the middle of the spectrum and offer a great alternative to the more expensive powered desks. One-Time Setup Desks like TrekDesk have their limitations. One-time setup desks, though many manufacturers will call them “adjustable,” are more like “set and forget” in practice because you won’t want to have to adjust the desk height very often, since it requires more than one person to accomplish (especially if you plan to try and leave your hardware on the desk during adjustment – not recommended!). These one-time setup adjustable-height desks typically use push-in pins to lock the desk legs in place and require lifting the desktop from at least two sides in order to remove the pegs and adjust the height. One-time setup height-adjustable desks are only suitable for a single user, non-sitting desk environment. If you want to be able to sit, stand, and walk at your treadmill desk or allow for multiple users, this low cost desk option is not for you. An example of this type of desk is the TrekDesk Treadmill Desk. Fixed-height desks cannot be adjusted for optimal ergonomic position or to accommodate multiple users. Looking around the web, you’ll see many treadmill desk pioneers have simply placed a board across the arms of their walking workstations and placed their laptops, keyboards, and monitors on top to allow them to work while walking. While this is usually a low cost option to start treadmill desking at home on your existing exercise equipment, it also poses great ergonomic risk that could lead to irksome health issues over months of use. Of the manufactured options, the Dr. McBabe's Walking Desk platform is the most recent to hit the market but suffers from the same ergonomic failures as its DIY alternatives (see our review of the Dr. McBabe's Walking Desk platform). The original treadmill desk was the Steelcase Walkstation, designed for corporate environments. Also called a "walking desk," "treadmill workstation," or "standing desk treadmill," a treadmill desk is simply the combination of a working surface that can hold a computer, keyboard, and monitor (or a laptop) and a powered treadmill base that permits the user to work while walking. The treadmill desk existed in laboratories for years before it was popularized by Dr. James A Levine of The Mayo Clinic in his book Move a Little, Lose a Lot. Levine collaborated with office furniture giant Steelcase to bring out the first commercially-produced treadmill desk, the Steelcase Walkstation, in 2007. While over 100,000 commercially-produced treadmill desks have been sold to date there are probably ten Do-it-Yourself (DIY) home-built walking desks for every one of them. Literally hundreds of bloggers have written about their own home-made treadmill desks and their quest to build one, which often began with a simple Google search for “make your own treadmill desk.” There’s a lot of misinformation out there from amateur carpenters so it pays to scrutinize carefully. For the only complete guide to making a safe and optimally productive treadmill desk see our experts' advice on DIY Treadmill Desks. For examples of home-built treadmill desks see our curated collection of DIY treadmill desk instructions and photos. What is a Manual Treadmill Desk? A manual treadmill desk can either refer to a treadmill base that operates under user power – rather than motor driven – or a manually height-adjustable desk designed for use in a treadmill desk application. Manually-adjustable desks can include both crank-adjusted and multi-person adjusted options. Human-powered, or manual treadmills are impractical in a treadmill workstation application both because of the difficulty of maintaining a stable position for typing and for the fact that using one will raise your heart rate well into the aerobic zone, defeating the purpose. Can I use a standing desk with a walking treadmill to make a treadmill desk workstation? Sit-to-Stand desks like the GeekDesk are usable both as a standing desk or as a key component of a treadmill desk system. In most scenarios, yes. Standing desks and sit-to-stand desks typically make the best desk for use with your treadmill desk workstation. Most of these desks are made to be adjustable to different users’ heights and offer extra flexibility for shared treadmill workstation environments. While all standing desks and sit-to-stand desks are made for standing and working, not all are made for using with a treadmill desk. You’ll need to make sure there’s enough clearance under the desk to allow for your treadmill to fit, as well as research the stability of the desk as it will be absorbing the vibrations transferred through the act of walking and working at the same time. Look to our reviews on Height-Adjustable Desks and Desktop Risers in the Product Reviews section for more information on which desks work the best for your treadmill desk. How many hours a day should I walk at my treadmill desk? The answer to this will vary depending on your current levels of fitness, treadmill desk experience, goals, type of work you do, among many other factors. We recommend pacing yourself (particularly important when you first start treadmill walking and working) and shifting positions regularly between sitting, standing, and walking at your treadmill desk. What kind of treadmill desks do the editors of WorkWhileWalking use? The fact is we are constantly changing out the treadmill and desk models we’re using as new products come in for evaluation. Look to our Product Reviews section for the most up-to-date information on our preferred treadmills to put under your desk and our preferred desks to put your treadmill under. The “Editors' Picks” are generally our staff favorites - taking into account things like noise levels, warranty coverage, size, etc. - regardless of the the walking desk models that each of staff members choose to have under his or her own feet. Does Ikea sell treadmill desks? If you’ve researched under-desk treadmills at all, you’ve likely seen many blog posts refer to Ikea products being used in treadmill desk applications. While it is true Ikea offers great table-top options to add to your standing desk and treadmill desk setups, there is no complete treadmill desk Ikea solution. There have also been issues with the quality of their standing desk products. If you’re looking to add a less expensive top to your treadmill desk, Ikea has many offerings, but if you’re looking for a complete treadmill desk solution, you’ll need to look elsewhere (see our Product Reviews section).